398cc single cylinder 4-stroke. 4-valve DOHC heads with liquid cooling. Dry sump with oil tank in the frame. 5-speed transmission with roller chain final drive. Mikuni 36mm carburettor with manual choke. Steel frame with USD i forks and monoshock rear suspension both with compression, rebound and preload adjustment. Separate low and high speed damping adjustment to rear shock. Single 310mm disc with 2-pot Nissin caliper, single 240mm rear disc with 2-pot Nissin caliper. Now I just know that in about thirty seconds time there’s going to be a chunk of readers snorting with derision at the preposterousness of what I am about to say. And it’s this. Suzuki’s DR-Z 400 SM is a brilliant motorbike. It’s feather light, handles beautifully, is comfortable as you like and goes quite nicely too. 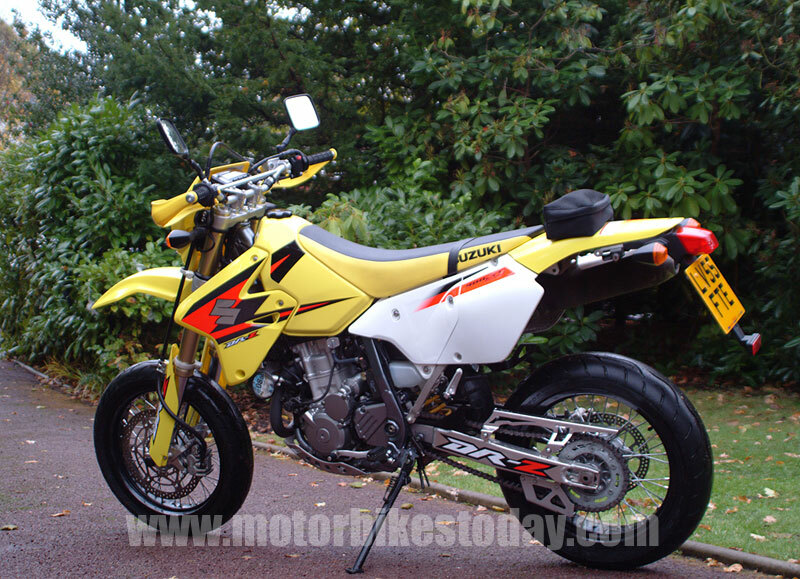 Oh, and it’s a mainstream factory produced Supermoto. It’s odd. I got chatting to a few other hardy souls braving the hail on their bikes. And a good proportion were on Supermotos. And none of those had anything kind to say about the little Suzuki. I don’t understand it. Is it really essential that your bike is so hard on your backside that you develop piles the size of tennis balls, relieved only when you get off the bike to top up the oil or to bolt something back on that has come loose? Is it so important to have a bike that can only be started after an arcane ritual involving valve lifters, copious amounts of human blood and several inches of skin? And is it really so vital that, so be a real Supermoto, your bike must make an appalling volume of noise, have virtually no instrumentation and have a headlamp nicked from a Victorian coal miner? If so then, of course you’re right. 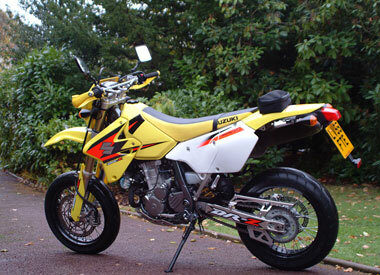 The DR-Z has no place calling itself a Supermoto. 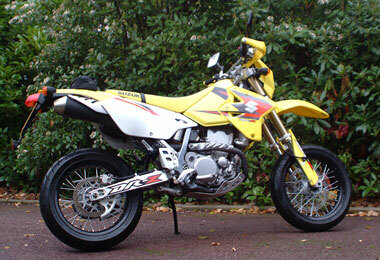 But, by the same token, in that case I’d suggest a Supermoto has no place calling itself a modern motorbike. 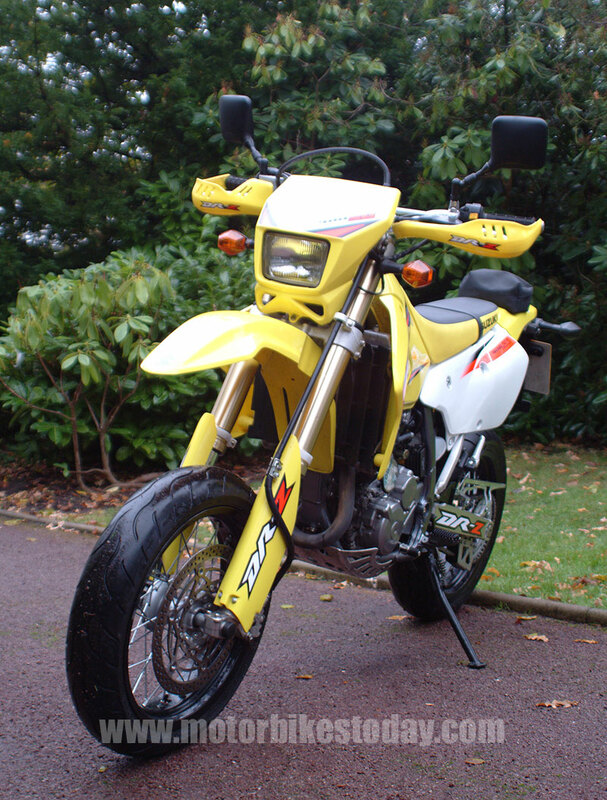 The Suzuki DR-Z 400 started off as a replacement for the venerable DR350 beloved of casual off road riders the world over as one of the most forgiving, likeable and generally easy to get along with ‘crossers ever. We tested the off road version back in 2002, when we took it to the Nurburgring for our litrebike test, initially for the photographer to use for getting around the 14 mile circuit. On that occasion we ended up track testing it, knobbly tyres and all, and were mightily impressed. So here we are, three years later, and the basic bike is pretty much unchanged. That gives us a tubular steel frame wrapped around a single cylinder water cooled 400cc engine. The motor is by no means a dinosaur though it would hardly qualify as bleeding edge either, and produces a respectable 40bhp and as near as dammit 40 N/m of torque as well. The skinny motocross wheels and tyres have been thrown away, as have the front forks and brakes. In their stead we find a meaty set of upside down forks holding some very nice looking 17” rims mounted with some particularly sticky looking tyres. Brakes are now way, way bigger than before, though there’s still just a single disc on the front. the whole lot weighs in at a mere 134kg – surprisingly a few kilos heavier than the ‘crosser but not exactly a heavyweight either. It’s still a long way up to the seat, though the plush suspension compresses enough to make things reasonable for all but the most vertically challenged. The bike is almost unbelievably skinny, seeming to wedge itself between the cheeks and add a certain degree of security in the process. It’s unexpectedly comfortable, though. The bars are wide but well positioned, the mirrors are big and clear, even at tickover, and the instrumentation is adequate. Starting does involve the quaint ritual of opening the choke which still nestles down by your left thigh before pressing the starter and firing it up. The engine catches easily and settles to a steady and utterly unthreatening tickover. It’s ever so quiet. Pulling away is as painless as you’d expect, the little bike pulling cleanly from low revs and the standard Suzuki gearbox being as slick as you’d expect. Despite the fact that the limited power on tap has rice puddings squaring up to the little Suzuki at every set of traffic lights, performance is actually very good when considered in context. 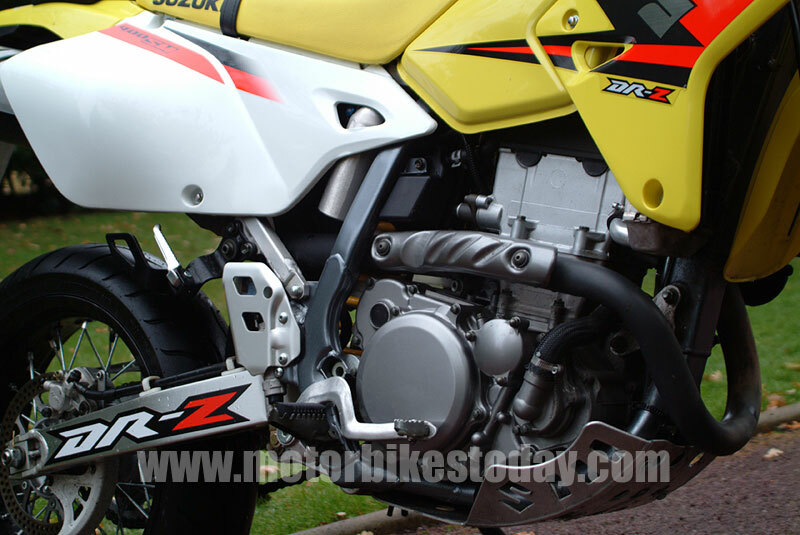 This is, after all, just 400cc of four stroke motocross engine. It's reliable and in a pretty soft state of tune as a result. And, all things considered, it really does go pretty well. While you're unlikely to rip the tread from the tyres, acceleration is sufficient to see off many bikes and pretty well any car at the lights. Top speed is largely academic, being limited more by the barn like aerodynamics and the sheer pain of riding a 'crosser at high speed than anything else. But it's quick enough to get you a ban if you really want to take the proverbial. Handling, as you'd expect with virtually no weight and sticky tyres, is excellent. This truly is a brilliant urban tool, taking no effort whatsoever to get turned, tracking steadily and soaking up the craters and berms that litter what passes for roads in London. Despite the fact that it was freezing cold and slippery as anything, I had no uncomfortable moments, no unexpected slides and no worries whatsoever. Brakes are progressive and effective, again as you'd expect, though the forks do dive an awfully long way when you haul it up hard. 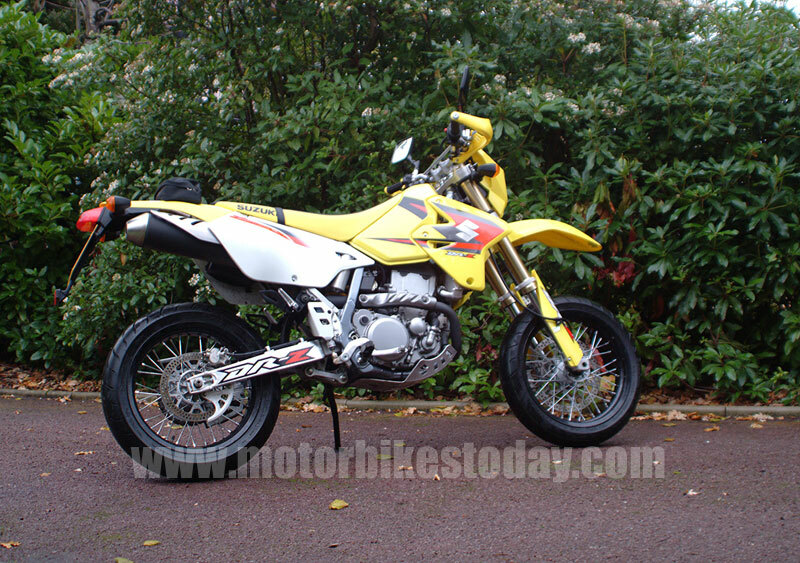 Read external Suzuki DR-Z400SM reviews on ciao.